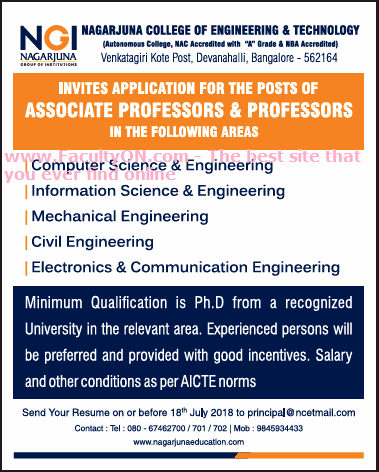 Nagarjuna College of Engineering & Technology, Bangalore has advertised in THE TIMES OF INDIA newspaper for the recruitment of Professor / Associate Professor jobs vacancies. Interested and eligible job aspirants are requested to apply on or before 18th July 2018. Check out further more details below. College Profile: Nagarjuna Group of Institutions (NGI) stands as an icon for enriching education ethics and practical learning for the benefit of the society and the young aspiring students. The philosophy and its purpose are rendered in its identity, expressing and committing to leadership and excellence in education. Qualifications: Minimum qualification is Ph.D from a recognized university in the relevant area. Experienced persons will be preferred and provided with good incentives. How to Apply: Interested and eligible candidates are requested to send CV with copies certificates and recent PP size photo to the following email address.